The locker that can hold it all! The Performance Plus 2.0 Series Multi-Use Locker is designed fully welded with 18-gauge steel frames. It includes: soft-close hinges, fully-lockable double walled doors, and an intuitive cable management solution which allows you to charge your power tools behind closed doors. There are four, fully-adjustable steel shelves and a removable closet rod with multi-peg hooks for a truly versatile setup. Find the right storage solution for your garage with the Performance Plus 2.0 Multi-Use Locker. Move your GLADIATOR Ready to Assemble Large GearBox or Extra Large GearBox off the floor with this Ready-to-Assemble cabinet bracket kit. This kit includes 3 brackets that install to the back of the cabinet and allows it to be mounted on GEARWALL Panels or GEARTRACK Channels. Installation of the brackets requires minimal tools and the hardware needed is all included in the kit - making them easy to install and ready to mount and reposition on any GLADIATOR Wall System. Performance Plus 2.0 Series 36-inch Locker in Black The locker that can hold it all! The Performance Plus 2.0 Series Multi-Use Locker is designed fully welded with 18-gauge steel frames. It includes: soft-close hinges, fully-lockable double walled doors, and an intuitive cable management solution which allows you to charge your power tools behind closed doors. There are four, fully-adjustable steel shelves and a removable closet rod with multi-peg hooks for a truly versatile setup. Find the right storage solution for your garage with the Performance Plus 2.0 Multi-Use Locker. 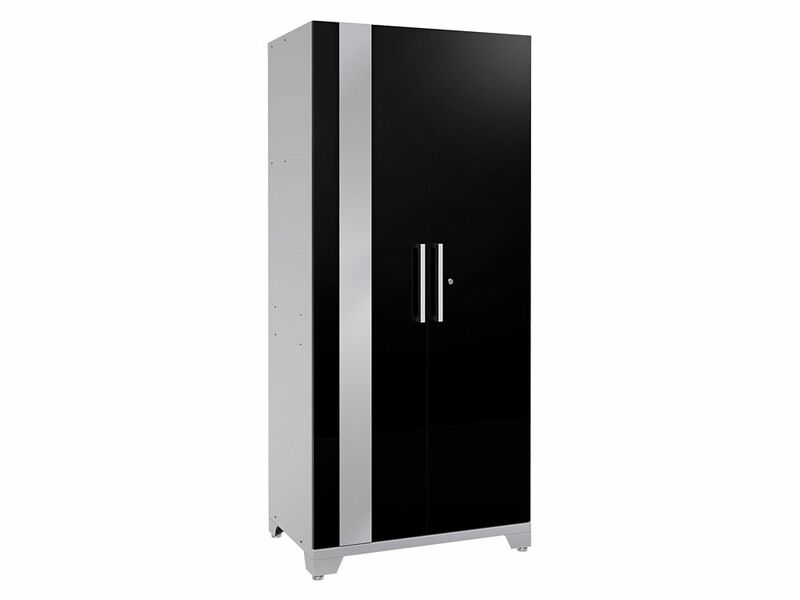 Performance Plus 2.0 Series 36-inch Locker in Black is rated 5.0 out of 5 by 19. Rated 5 out of 5 by Jake from Amazing products! I bought the 7 piece Performance Plus 2.0 series. Everything arrived on time, no dents or problems. I will be ordering more for my other garage. Rated 5 out of 5 by Stephen from Super Sturdy. I bought 4 of these along with a 7 unit cabinet system. They were far more industrial strength than I expected. The adjustable shelving allows me to hold far more than conventional shelving. Everything is now locked up! Rated 5 out of 5 by Nick from Great HUGE Locker! Got 2 of these & I LOVE them! HUGE storage in a heavy duty sturdy Locker Cab, 3 adults can easily stand inside 1, so nice.....ONCE the doors are dialed in. Worked extensively to make the doors square & even height wise on ALL 3 of my Lockers I received. Had to remove the 2 hinge screws in each hinge that are not in slots & adjust the hinges upward with the 2 remaining slotted screws, then re-drill holes for the other 2 screws to make the doors good & even & closing properly. Found a LOT of the hinge screws were already stripped as I was going thru checking tightness & adjusting everything, I had to buy a bunch of #10 x 0.5" sheetmetal screws to replace all the stripped screws I found, but now all hinges are tight & properly secured. 1 door edge was 'rippled' but not scratched, so Newage is sending me a replacement set of doors. My product issues are a MAJOR LACK of QUALITY CONTROL from this company, as experienced with the rest of my issues on my other pieces. I give Newage a MINUS 5 on Quality Control with my order, & I have communicated this to their CS. Once again the nice supplied Wall Brackets made it possible to install this Locker by myself with help from my floor jack. The included hook hangers & rod hanger are also VERY nice features. Rated 5 out of 5 by TedY from These cabinets are beautiful! I bought these cabinets to put into the garage of a new home we purchased. They arrived ahead of schedule and were delivered right to my garage door. The video that details how to unpack the cabinets was very helpful. I recommend anyone making a purchase review the video prior to attempting to unpacking the units. There are lots of packing materials to dispose of, but not one of the six units I purchased was damage or even scratched. Rated 5 out of 5 by Dean27 from Big Strong Storage Bought this cabinet to consolidate contents of two other cabinets and hide the contents behind doors. The frame is strong, the shelves are strong and it did the job. The locker arrived very well packaged on the pallet with no damage. It was easy to assemble and use. I recommend two people to remove it from the pallet and lay it down to assemble the adjustable feet. The adjustable feet worked very well on a sloped garage floor. I would buy again. Rated 5 out of 5 by Jeff from Great product! Easy to assemble and quality materials. ... Great product! Easy to assemble and quality materials. Very sturdy. Rated 5 out of 5 by Judi from Overall this cabinet is excellent. We have a toddler grandson and wanted to make sure that every... Overall this cabinet is excellent. We have a toddler grandson and wanted to make sure that everything that was in our garage was as protected from his ability to ingest it as was humanly possible. The cabinet is heavy so that fact that it is delivered to your driveway is a big plus. It was easy enough to unbox. The box seemed find but the side did have a small dent in it. I used a piece of wood and a mallet and popped it back out easily enough. The ability to customize the inside was unecessary for us because we only needed shelves but we kept the parts in case that ever changes. It locks solid and looks great with the rest of our garage toolboxes even though we put this in a separate part of the garage. Every thing that is liquid, toxic or just plain sharp (like electric hedge trimmer) fit in here and then some! It actually made our garage look alot more tidy because i don't think we realized how much we had tucked here or there until we could lock up all this stuff.